Mike Ashley ‘makes it clear’ he wants to keep Benitez at NUFC – but there’s a catch – Report – NUFC blog – Newcastle United blog – NUFC Fixtures, News and Forum. 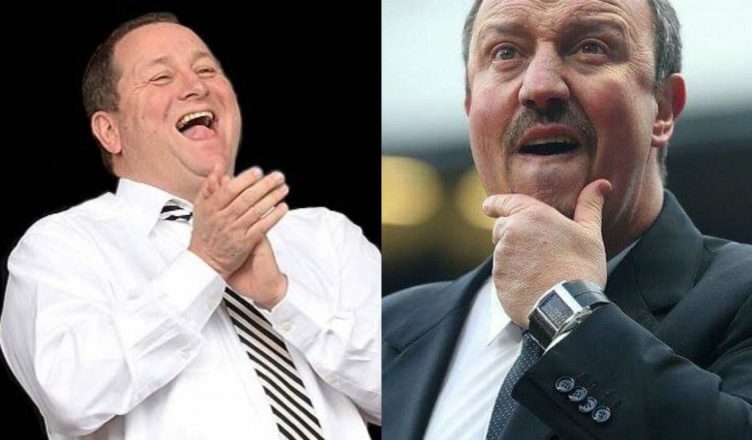 Mike Ashley has ‘made it clear’ that he wants to keep Rafa Benitez at the club according to the Chronicle – yet the same report suggests that the Spaniard’s been told that ‘some things won’t change’. That sounds about right, doesn’t it. I’m sure Ashley does want Rafa to stay at St James’ Park to guarantee the club stay up season upon season, but he can’t have a world class manager at the helm if he’s not prepared to show the ambition someone of his calibre will rightfully demand at a club with our untapped potential. The report states that Rafa will only sign a deal that’s ‘right in his eyes’ – so it’s ironic that Ashley is ‘keen’ to keep him at the club, yet, in the same breath, he’s also unwilling to change; suggesting he can’t be all that serious about delivering what’s needed to keep him around. Newcastle United owner Mike Ashley is understood to be keen for Rafa Benitez to stay on as manager at St James’ Park beyond this season – but the Toon boss may have to be accept some things won’t change. Both Ashley and managing director Lee Charnley have made a written offer to Benitez to entice him to extend his current deal. Although no formal talks have taken place with Benitez, his agent and Charnley, the club have communicated their desire to keep him as boss in general conversations since the window closed. Benitez is happy to stay on Tyneside as it allows him to be near his family in the North-West but he is desperate to see Newcastle to show more ambition and will only sign if the deal is right in his eyes. Benitez is aware that there is no bottomless pit of money to spend and his requests for new players, a new training ground and a new Academy will have to be staggered out over a five-year plan. That is the situation he is currently weighing up. Benitez had made the case to Ashley that pumping funds into the Academy could save him a lot of money in the next few years while he feels that parts of the first team training base need updating. However, it is unlikely that plans for both the youth system and a new training ground will be pushed through for this summer. Any funding for training ground improvements must also come out of the club’s transfer pot which would affect Benitez’s plans for recruitment in the next window. The big issue appears to be the ‘money available’ for training ground upgrades and Academy improvements – with Ashley said to be claiming that any investment here would have to come out of Rafa’s transfer pot; unless he is happy to see these upgrades happen over time. Can Benitez trust Ashley? Can Ashley find a way to keep Newcastle up on the cheap without Benitez? There’s plenty questions, but we need answers sooner rather than later. Our big to stay up must take priority for now, but, if and when that is secured, Ashley and co. must start and take the Spaniard’s future a little more seriously if they really are as keen to keep him as they claim they are. How about the 9 million he stole off the club from selling Strawberry Place? Wasn’t that a club asset that if sold could have been pumped back into the club via part funding towards a new training ground? The man is a vampire. No matter how you angle this, the only way forward is cashley sell then p*** off. I only hope rafa signs in the hope that NUFC WILL be sold within his new contractual period. But Rafa has already witnessed the lies and false starts from the man who cannot be trusted as far as you can spit.